No safe room is complete without a Castellex Air filtration system! A panic room, bunker, or bomb shelter only goes part of the way to protecting your family and possessions. In the event of a nuclear, biological, or chemical attack, you need to be able to control the environment inside your protected space. Castellex fallout shelter ventilation systems are built to give maximum peace of mind. They will operate efficiently in critical situations, and provide permanent protection for everyday installations such as homes in areas with a high allergen or pollution count. 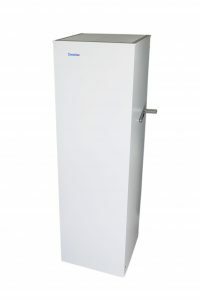 By creating a positive air pressure within the protected area, your Castellex nuclear, biological, and chemical (NBC) filtration system makes it impossible for tainted air to enter the room without passing through the ventilation unit: a system of filters working at 99.99% accuracy to remove particles down to 0.3 microns (micrometres), thereby achieving the highest possible H14 HEPA rating. Power consumption is efficient and operational noise is kept to a minimum even in our most powerful models, which are capable of providing 500 m3/h for up to 55 people—at a noise level only slightly higher than conversational speech. Our nuclear biological chemical filter units are suitable for installation in private homes, apartments, and mobile assets as well as schools, hospitals, prisons, and other civic architecture. Castellex products can be fitted in industrial and commercial premises, and are recommended for use in high-risk locations such as embassies, palaces, and government buildings. Designed as life support systems for catastrophic events including outbreaks of warfare, NBC attack, nuclear leakage, power plant failure, and forest fires, your Castellex system is built with multiple failsafes. Powerful backup batteries and included or optional power generators ensure continuous operation in even the most dire circumstances. USB power ports and mains sockets enable your underground bunker air filtration system to provide power for communications devices and other essentials. Protect your family. Protect your employees. Protect your assets. Castellex NBC systems provide life support and reliable air quality control. At all times. All known warfare gases. Stopped. Castellex safe room ventilation systems are fitted with two- or three-stage filtration units, which include an activated carbon filter capable of removing all known warfare gases from the air. Additionally, nuclear contaminants including radioactive iodine are scrubbed, as are acidic gases, exhaust gases, biological agents, and volatile organic compounds. The contaminants are held in a hermetically-sealed dump until they can be safely retrieved and dealt with. Positive pressure filtration. Keeping your safe room safe. Air always tries to equalize pressure, seeping in through microscopic cracks caused by the natural movement of buildings. Your Castellex chemical air filter prevents this from happening by elevating the pressure in your panic room or protected area until it is higher than the pressure of the air outside. The pressure inside the room is perfectly comfortable for humans, but effectively forms a box that pushes against microscopic entry points to hold contaminated air at bay. The only way for air to enter the room is through the double- or triple-filtered ventilator, which operates at near-perfect efficiency. When extreme situations occur, failure is not an option. Your Castellex NBC air filtration system is built to stay operational when everything else is falling apart. Double, triple, and quadruple failsafes ensure steady power is supplied by the unit even when the mains are out and backup batteries have been exhausted. And alternate power systems stand by to take over if the active system is compromised. Blast valves operating in a high 123-129 psi prevent massive changes in safe room air pressure (positive and negative) if concussive events occur (such as explosions). Overpressure valves keep the mean pressure within acceptable ranges. You Castellex life support system (LSS) is just that: a life support system. And it won’t fail, even when standard and auxiliary power sources are going down outside. Our nuclear, biological, and chemical LSS are also designed with secondary ventilation units, which take over in the event that the primary unit stops working. Quietly competent. Even at high power. 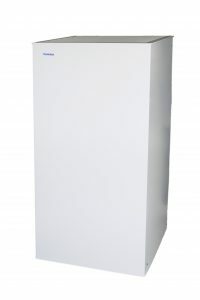 Castellex NBC air systems come in a range of power ratings. But even the most powerful units, which are capable of maintaining life support for large panic rooms and bunkers, operate at a noise level no greater than 62dBA. That’s only just louder than the average conversation. Life support. On the move. Castellex life support systems are suitable for vehicular installation. Fit in your yacht’s panic room to provide protection for your family, guests, and crew when sailing into dangerous waters, war zones, or polluted areas. Fit in private cars to create a fully mobile, completely protected environment. Or install in working and military vehicles that habitually go into heavily-polluted or high-risk areas: for example, emergency vehicles designed to fight fires in forests and on oil rigs. Your Castellex NBC life support system is designed to be expandable. Optional extras include O2 indicators, air pressure indicators, cooling and heating (HVAC) units, and more. Add automatic power generators for extra levels of operational reliability. Fit extra USB sockets and mains sockets. All Castellex products are made in the UK from high-quality materials, and finished attractively. Big cities and modern environments suffer from greatly decreased air quality. Castellex nuclear, biological, and chemical (NBC) life support systems are also suited to installation in domestic, commercial, and civic buildings where pollution has an adverse effect on the inhabitants or users. 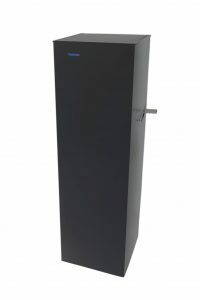 They are perfect for installing in schools and hospitals: their highest-level H14 HEPA rating and activated carbon filtration make these systems suitable for managing contamination in medical environments as well as removing irritants, allergens, and pollutants from places in which children and vulnerable adults are found. From improving sleep quality to managing respiratory problems, Castellex life support systems are designed with health in mind. Peace of mind. Now, and forever. Your Castellex NBC system comes with a year’s warranty. And our aftercare service is available to keep your bunker air filtration unit operating perfectly for as long as you own it. Not sure on the perfect unit for your needs? We’ll advise on everything, from the best base unit to the ideal combination of extras.